His Majesty The King, Her Majesty The Gyaltsuen and His Royal Highness The Gyalsey granted an audience to over 5,000 people at Gangteng Sa-Ngag Choeling Monastery in Wangdue Phodrang yesterday. People from seven gewogs: Gangteng, Bjenag, Phobji, Nyishog, Saephu, Athang, and Dangchhu gathered for the opportune moment. Gangtey Truelku Kuenzang Rigzin Pema Namgay offered Ku-Sung-Thug-Mendrel to His Majesty The King and His Royal Highness The Gyalsey inside the Guru Lhakhang. 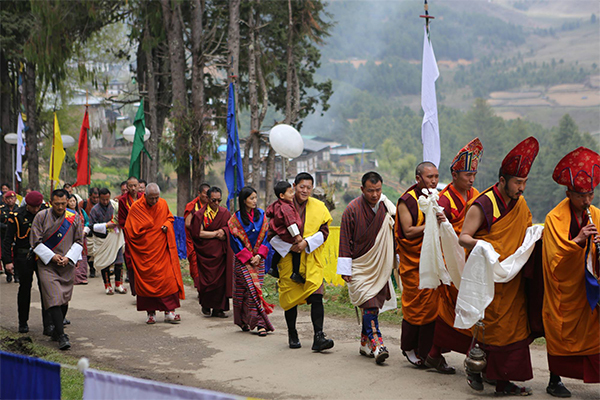 His Majesty granted tokha to the people of seven gewogs, students from the nearby schools and monks from the shedra. Creating a fun atmosphere, entertainment programmes and lucky draw were organised. Winners were awarded electric household appliances and farm tools. People said it was an absolute honour and delight to have had an audience with their majesties and His Royal Highness The Gyalsey. “I am extremely happy that His Majesty, Her Majesty The Gyaltshen and His Royal Highness The Gyalsey granted us an audience here at Gangteng,” said one of the residents, Tshering Dorji. 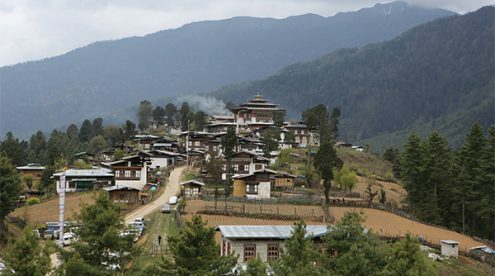 Gangteng Sa-Ngag Choeling Monastery was founded by the first Gangteng Truelku Gyalsey Pema Thinley, as prophesied by Terton Pema Lingpa.